Despite being significantly thinner than its predecessor, the iPhone 5 offers roughly the same battery life. Which, depending on how you use your phone, means anywhere from a full day or more of use, to requiring a late-afternoon charging session. For those in the latter camp—and I occasionally find myself in that group, especially when doing things like covering last week’s Macworld/iWorld show—a battery case is an appealing option. These accessories protect your phone like a case, but include an internal battery for charging—or live-powering—the handset throughout the day. Unfortunately, the iPhone 5’s taller, thinner shape means battery cases for the iPhone 4/4S don’t fit; and the new Lightning connector means vendors have had to completely retool their electronics. 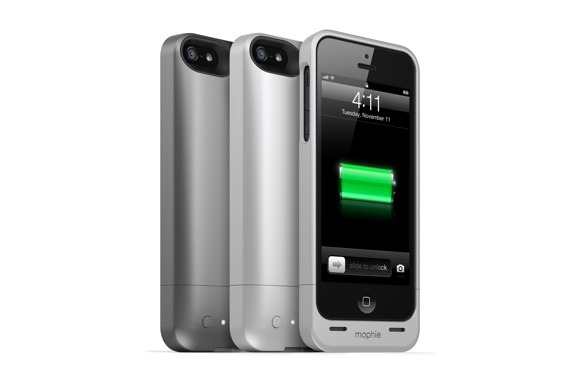 A slew of iPhone 5-compatible battery cases were previewed at CES, but you won’t yet find those models on store shelves. 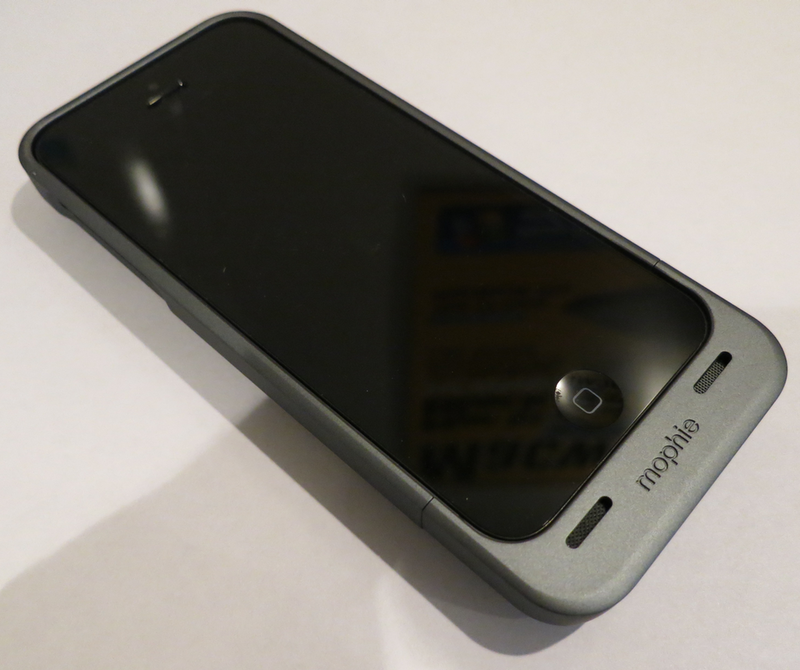 The first model we’ve seen that’s actually available for sale is from—fittingly—veteran battery-case maker Mophie. Just yesterday, the company let slip details about its new $80 Juice Pack Helium, currently available for pre-order. The company sent us one of the first units, and we’ve been testing it today. Mophie’s $100 Juice Pack Plus has been our favorite iPhone 4/4S battery case since we reviewed it, but the new Juice Pack Helium appears to be a direct descendent of the company’s Juice Pack Air, which is slimmer than the Plus and uses a 25-percent-smaller battery (1500mAh for the Helium and Air, compared to 2000mAh for the Plus). As with previous Juice Packs, you insert your phone by pulling apart the Helium’s top and bottom sections, sliding your iPhone 5 into the larger section, and then sliding the smaller section of the case on until it clicks into place. There are a few things new with the Helium, though. The first is that it’s the bottom section of the Juice Pack Helium that’s smaller and, thus, more-easily removable, which is convenient if you’ve got an iPhone 5 dock cradle you prefer to use when you’re at your desk—you can just pull off the bottom piece of the case and dock your phone. The second is that inside the case, you’ll find a few tiny, silicone nibs that offer a bit of shock cushioning and keep the inside of the Helium from scratching the metal back of your iPhone. Finally, whereas the Juice Pack Plus and Air hosted LED status lights, a standby switch, and a battery-test button on the bottom edge of the case, these items are on the back of the Helium, near the bottom. Like the Juice Pack Air, the Helium provides access to your phone’s Ring/Silent switch, volume buttons, and Sleep/Wake button with cutouts. In an improvement over the Air, a single opening exposes the Ring/Silent switch and volume buttons, making it easer to use these controls. (The Air used two separate openings, which made it difficult to flick the Ring/Silent switch.) We liked the Juick Pack Plus’s pass-through volume buttons, but it appears the Helium is too thin to allow for that feature. Speaking of thinness, Mophie says the Juice Pack Helium is its thinnest battery case yet, and while that’s true, it’s fair to point out that the company has the iPhone 5 to thank for this: The phone’s own thinner profile has allowed Mophie to make a thinner case. And thin it is, relatively speaking, at just 0.59 inch from front to back, compared to 0.30 inch for the iPhone 5 itself, 0.68 inch for the Juice Pack Air, and 0.71 inch for the Juice Pack Plus. The Helium weighs just 2.4 ounces, slightly lighter than the Air (2.5 ounces) and the Plus (2.9 ounces), and is roughly the same width as the Air and Plus, though it’s of course noticeably taller to fit the iPhone 5. The Helium channels audio to and from the iPhone’s bottom-mounted speaker and microphone through front-facing openings at the bottom of the case. New in the Helium are mesh covers to keep dust and dirt out of these openings. The Helium has a soft-touch finish, like its predecessors, although that finish extends all the way around to the sides of the case. On earlier Juice Pack models, the sides of the case sported a slicker, rigid finish. 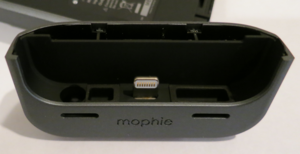 Mophie sent us the Dark Metallic color; its gunmetal appearance is attractive, and it seems as though it will resist scuffs and scratches a bit better than the surface of older Juice Pack models. The Helium will also be available in a Silver version. One drawback of the new design is that, because the iPhone 5 positions both the Lightning-connector port and the headphone jack on the bottom edge of the phone, and the bottom of the Juice Pack Helium hosts most of the battery’s circuitry, your iPhone’s headphone jack is recessed considerably—nearly half an inch—from the outside of the case. If you use Apple’s stock EarPods, or third-party headphones with a similarly slim (and straight) headphone plug, this won’t be a problem, but if your headphones use a thicker plug, or an angled plug, that plug won’t fit. Mophie includes a three-inch pass-through headphone extension that lets you use any headphone plug with the Juice Pack Helium, but it’s something you’ll need to remember to bring with you all the time, or you’ll find yourself with a great music player, great headphones, and no way to connect the two. Interestingly, the bottom of the Juice Pack Helium hosts a couple metal contacts around the Micro USB port that look almost like contact-charging pads. The case’s manual doesn’t mention what these contacts are for; we’ve asked Mophie for comment. With the Juice Pack Helium on your phone, switching the case’s standby switch to On simultaneously powers your iPhone and charges your phone’s battery. In other words, the iPhone uses the Helium’s battery first, switching to its own battery only when the Helium’s battery is dead (or you switch the Helium back to standby mode). According to Mophie, the Helium extends your phone’s battery life by up to 80 percent. Specifically, the company says you get up to six hours of additional talk time; 30 hours of additional audio playback; seven hours of additional video playback; seven hours of additional Wi-Fi use; or six hours of 3G or LTE use. (These estimates are similar to those for the Juice Pack Air when used with an iPhone 4S, and not quite as long as estimates for the Juice Pack Plus.) 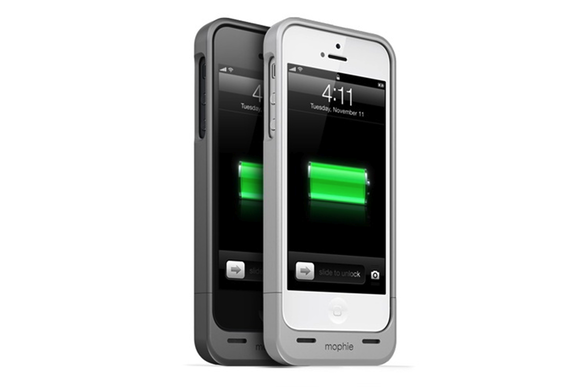 Mophie says the Juice Pack Helium can fully charge in two to three hours. We haven’t had a chance to test these claims, of course; we’ll be doing so soon. If you’ve been pining for a battery case for your iPhone 5, the Juice Pack Helium is the first Apple-certified product to ship. And it looks to live up to Mophie’s battery-case reputation: In our initial use, it’s easy to put on, works well, and looks great. We’ll be putting it through more-rigorous testing, so stay tuned for our review.